Summary: The first day of school for the newly minted seventh graders of Tæring should be the start to a perfectly boring year. But minutes into that day, Pierre Anthon stands up and announces “Nothing matters. I’ve known that for a long time. So nothing’s worth doing. I just realized that.” With that, he leaves the classroom and goes to sit in the plum tree outside his house. He taunts the other children from his perch, and though they initially pretend he doesn’t affect them, they soon decide something must be done. They want to show Pierre that there is meaning in their lives, and so the kids start collecting items that matter. They keep it all in an abandoned sawmill outside of town, creating a heap of meaning. It soon turns into each child demanding an item they know another cherishes. While it begins with beloved books or favorite shoes, it quickly takes a dark turn. As the heap grows higher, the class of 7A must decide if their meaning will ever come at too high a cost. The inside flap of this book states it’s a “Lord of the Flies for the 21st century.” I was immediately turned off. A more boring book than Lord of the Flies is hard to come by. Look at those stupid boys run around an island, and look! CHRISTIAN ALLEGORY BEATING ME OVER THE HEAD. That comparison, along with the rather emo-looking cover, had me convinced Nothing going to be boring and angsty. So I half-heartedly started reading, and I am so freaking glad I did. This book is haunting. From the first page onward, it just blew me away. The story itself is so simple, yet compelling. Tæring is a town that could be in any developed nation in the world, and the kids could be any 7th graders. Unlike Lord of the Flies, this book does not take place in a vacuum. The kids search for meaning in the world around them, a world that their parents built and that they’ve always known. Pierre Anthon makes them look at their environment for the first time, and they revolt at what they find there. They don’t want to accept the boring buildings and streets as meaningless, because that would mean Pierre was right. We exist with purpose; things matter. It’s this urgent quest for meaning that makes the events so plausible. It was a great move on Teller’s part to have characters in middle school. That’s the age at which most people will begin to bow to peer pressure over familial pressure. The kids of Nothing are really well crafted, and the way things escalate seems so natural. Teller brings all sorts of motives and emotions into the demands, and we gain insight to the characters without having much backstory. I loved how they judged the inventiveness of the demand, and that the kids started taking longer to think of a really meaningful (read: hurtful for the other person to give up) item that was to be sacrificed to the heap of meaning. The narrator, Agnes, is another great part of this book. Her voice is never over-assertive. In fact, there were times when I forgot there was a separation. She often speaks of herself as part of the class, and how the class reacts. But you start to realize Agnes is a bit of an instigator. Her demand of Gerta starts the more sinister trend, and the other kids look to her for leadership and gutsy ideas. Pierre also seems to realize that his words affect her more than the others, often singling her out from the plum tree. The most astonishing part of the novel is the language, and the way Teller delivers very blunt messages in an easily absorbed way. By having the kids try to find things that mean something, and having Pierre as a character who can scoff at everything, she builds this exploration around what the hell anything means. Sorry, I know it’s redundant. But the sentences are so succinct, and nothing is ever excessive. From the material to the abstract, she manages to comment on the way we ascribe importance to things. And the way our perception of things alters meaning – “the school was so gray and ugly and angular that I almost couldn’t catch my breath, and all of a sudden it was as if the school were life itself, and it wasn’t how life was supposed to look but did anyway.” The lyrical nature of the words paired with the really desolate outlook is so striking, but without being mopey or absurd. It’s terribly honest but beautiful all at once. Even lanuange itself is not safe from her. Teller often grafts these three little variations of a word or an idea onto the end of a paragraph. Like, “Scared, more scared, most scared.” “Good, better, best.” “Victory is sweet. Victory is. Victory.” To me, she was breaking down the meaning of the very words she used to tell a story about meaning. She so deftly points out how everything is fabricated, even the way we communicate. Then she ties it back to the gaping holes in the logic of our day-to-day existence. It’s this tightly constructed package of questions and more questions, but it’s up to you to decide if there’s any meaning after all. So I think she may have stolen the idea for Pierre sitting in his plum tree from Hey! Arnold. Stoop kid, anyone? 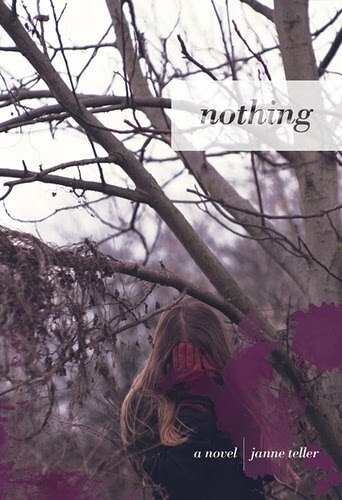 Nothing is an excellent novel, and I strongly recommend it for both teens and adults. It is disturbing and haunting, and it is makes you closely examine the axioms we hold onto so dearly (and desperately). From innocence to faith, from love to revenge, the kids of 7A are mirrors for ourselves and our own struggles with meaning. This novel will stay with you, and don’t be surprised if you hear Pierre’s voice ringing in your head for weeks to come. Seriously, I think I’m going to have to read this between two super light fun books, because it sounds really heavy. Yet beautiful all at the same time. Reading it between two lighter books is definitely a good idea. I watched some Avatar afterwards to stop myself from despairing about things. But damn, this book is a stunner. Totally worth the terrible thoughts it causes. I’ll make sure to read it between two fun girly and/or young adult books just to be on the safe side. Pierre is brilliant, and the facts he spouts off are the very things that I try not to think about when I’m caught in the endless banality of the library. And seriously, this blog is creating problems! I just want to read all the time now. Well, more than usual since you guys are giving me such wonderful suggestions. That being said, I’m going to be the weird one and definitely not read this, lol. I HATE stuff like this. It just really irritates me. There is no objective meaning to anything. You’ve figured this out and you’re sitting in a tree. Big deal. And throwing things you care about in a big old pile of “meaning” just ends up stripping them of whatever meaning they might have had, blah blah blah. Forgive me if I’m way off track, but this kind of thing just really rubs me the wrong way for some reason. I won’t contemplate for a second whether or not life is meaningless because obviously it is. Spoilers, life is subjective and what you put into it is what you get out of it. Maybe that realization puts you up in a tree, or maybe it makes you hold all those little “insignificant” things (and people, I’m assuming, considering the dark ambiguous tone your review takes) all the more closely to you. As you say, Kelly, it’s up to you to decide. If nothing else, we’ve got free will, our actions have repercussions, and not everyone has jumped on the life-has-no-meaning train. So do you seriously want to make the decision that has you hanging out alone in a tree intentionally making other people unhappy? Or randomly murdering people on a beach? No thanks. I also disliked the Stranger, mainly b/c the dude was so blatantly crafted to push our buttons. He was a straight up sociopath, so I couldn’t relate at all. And I didn’t care if he died (which I don’t remember if he actually does). But the kids in this book care so much, and are driven by such an urgency that I couldn’t help but care about their quest. It’s interesting also because they are middle-schoolers, and this can also work as a chronicle of the discovery of the world outside their own heads. It reminded me of “The Dead” in this aspect. And Pierre is endearing, as he cares even though he so emphatically denies it (at least I think he does). There is also a sly, black humor that comes through at points. So it’s not all heavy stuff. For me, the exploration of meaning is more about providing perspective. If I’m stressing about something dumb, I will think about the insignificance of that one thing over the course of my life. Sometimes it helps, sometimes it doesn’t. And then at other times, I think of the one Hitchhiker book in which there is a simulator that shows how small and ridiculous we are when compared to the universe, and everyone else goes crazy except Zaphod (I think). Another series I have to revisit! So I guess my rambling reply is that I completely understand why you won’t enjoy this book. And I completely agree with you about no overall meaning causes one to hold onto the things we ascribe meaning to even tighter. You just stated it perfectly. Your philosophical rants are meaningless to me. Sounds nice and well written review too! Thanks! I had to read this for a paper/presentation for my Adolescent Literature class. At varioius times, I had to re-read over some areas because in my mind I didn’t think that what was going on was even possible. A very haunting read, Nothing will be hard to forget…at least for the time being.